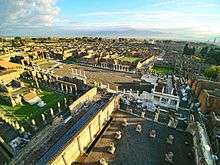 Other major forums are found in Italy; however, they are not to be confused with the piazza of the modern town, which may have originated from a number of different types of ancient civic centers, or more likely was its own type. While similar in use and function to forums, most were created in the Middle Ages and are often not a part of the original city footprint. In new Roman towns the Forum was usually located at, or just off, the intersection of the main north-south and east-west streets (the Cardo and Decumanus). All forums would have a Temple of Jupiter at the north end, and would also contain other temples, as well as the Basilica; a public weights and measures table, so customers at the market could ensure they were not being sold short measures; and would often have the baths nearby. At election times, candidates would use the steps of the temples in the forum to make their election speeches, and would expect their clients to come to support them. ↑ From Proto-Indo-European *dʰworom "enclosure, courtyard", i.e. "something enclosed by a door"; cognate with Old Church Slavonic дворъ dvorŭ "court, courtyard". ↑ Abbott, Frank Frost; Johnson, Allan Chester (1926). Municipal Administration in the Roman Empire. Princeton: Princeton University Press. p. 12.